As a homeowner, you know that just about anything that can go wrong around the house, will. Some repairs require hiring a professional, but there are countless situations where you can take care of simple fixes on your own. Not only will you save money by handling repairs and improvements yourself, you will also get the satisfaction of learning a new skill. Before jumping into any home repair project, it is important to consider safety. Any project that deals with electricity, for example, requires that you cut off the power in the area of the house you will be working on to reduce the risk of electric shock. It is always a good idea to research thoroughly before trying out your skills for a repair around the house. However, even though some repairs require a little more caution, it is still easy and safe to do many projects on your own. Below, learn about nine of the easiest repairs and upgrades you can make at home without hiring a professional contractor. One of the most obnoxious issues around the house is also the easiest to fix. If you have doors that squeak, spraying WD-40 on the hinges will usually do the trick. However, spraying oils can leave a residue on your door or wall. A better method is to remove the pin from each hinge and rub the pin with petroleum jelly. Once you replace the pins, the squeak will go away, and you will not have to deal with any mess. Grout between tiles can easily become dirty and stained, over time. If the tiles in your bathroom or kitchen are looking dingy, it is easy to re-grout on your own. First, you will need to cut away the existing grout with a carbide blade or a rotary tool, which is recommended for larger areas. Next, simply mix a batch of new grout, available from most hardware stores, and apply it with a margin float tool. After the area has dried for about 10 minutes, you can wipe the tiles with a damp sponge to remove residue. A faulty flush can lead to a variety of annoying problems, such as not being able to use your toilet – at all. 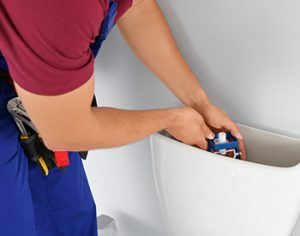 Fixing this toilet issue is usually as simple as lifting the lid of the bowl and reattaching the chain. On the other hand, a stuck lever can also cause water to trickle in the bowl nonstop. In these cases, you may need to replace the whole flush system, which is easy to do with a replacement kit. Holes and tears in your drywall are unsightly, but these issues are easier to fix than you might imagine. If you are dealing with a small hole, a mesh patch will usually take care of the problem. Start by covering the hole with the patch and then applying joint compound thinly over the patch. After letting the compound dry overnight, apply two more coats, allowing the compound to dry between applications. Once the final layer has dried, simply sand it until smooth, then prime and paint the area as you would for any other wall. Filling in nail holes is incredibly easy to do on your own. All you need to repair a nail hole is lightweight spackle, a putty knife, matching wall paint and a small brush. First, apply a small amount of putty over the nail hole with the putty knife. Once the hole is filled in, wipe the excess putty off the surrounding area, and let it dry. Finally, apply a small amount of paint to the area, and blend it into the surrounding wall. If there is any roughness to the putty after it dries, make sure you sand it down before painting. Caulk around your tub, sink or other bathroom and kitchen features can easily wear out and peel with age. Luckily, it is simple to replace worn caulk yourself. Be sure you completely remove the old caulk by using a razor or a product designed to soften old caulk to the point where you can peel it with a putty knife. With the old material removed, clean and dry the area, then use a caulking gun to fill in the cracks. Guides and other tools are available on the market to help you distribute the caulk more evenly. Almost everyone will have to deal with a leaky faucet at one point or another. Not only is a dripping faucet annoying, it can also waste a significant amount of water when left unchecked. Anytime you work on water fixtures in your home, it is important to shut off the water valve for the faucet in question. Before taking the fixture apart, you will need to determine what type of faucet you have, first, as the steps can vary, based on the style of fixture you have. Compression-style faucets, the most common type, can be fixed by unscrewing and removing the handle, which may require taking off decorative caps over the screws. Next, take out the nut and unscrew the valve stem from the housing before finally removing the washer. In most cases, the washer is what needs to be replaced. Simply determine the size of washer you need, pick up a replacement and reassemble the system in the manner that you took it apart. Swapping out a dated showerhead is one of the easiest and cheapest ways to upgrade your bathroom in a matter of minutes. All you need for this fix is a wrench and a new showerhead. Start by unscrewing the old showerhead, which may require using the wrench. Remove any excess materials, such as gaskets or debris that may be on the pipe once the showerhead is off. Next, simply screw on the new family showerhead until it is tight. If you are not able to get a proper seal, it may be necessary to wrap the pipe with a few layers of plumber’s tape before screwing in the new showerhead. Whether you need to repair a broken light fixture or you want to upgrade an existing one, it is easy to do a replacement by yourself. Anytime you deal with electricity in your home, be sure to shut off the power in that area and test the switch to ensure that there is no electricity going to your fixture. Start by unscrewing the fixture from the wall or ceiling and removing it from the mounting bracket. Next, disconnect the wires and untangle them so that you can pull the old fixture off and remove the old mounting bracket. To install the new fixture, start by attaching its bracket to the wall or ceiling, and twisting the corresponding colored wires together, and covering the connections with wire nuts. Finally, push the wires into the mount where they fit and anchor the new fixture to the bracket according to the instructions that came with the unit.